Professor Shahidul Islam (left) accepts his award from the President of the Korean Endocrine Society, Professor Dongsun Kim. 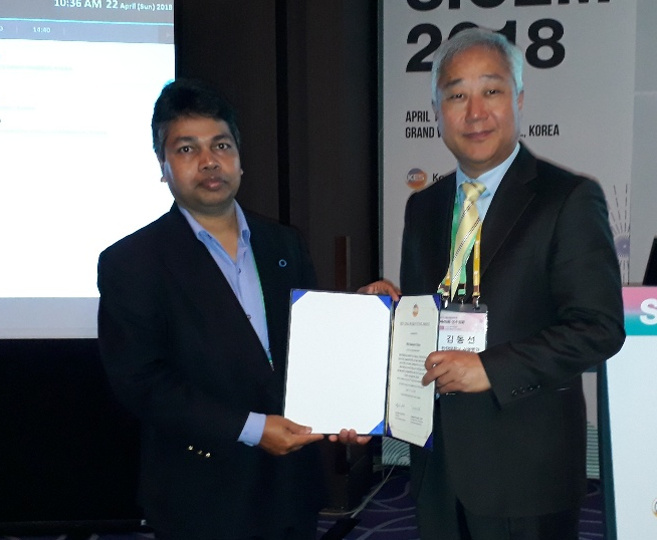 Professor Shahidul Islam was awarded the prize for the Best Oral Presenter in the general category at the 2018 Seoul International Conference on Endocrinology and Metabolism (SICEM), an event organised by the Korean Endocrine Society. Islam’s presentation was derived from his considerable research on the major public health problem of Type 2 diabetes or non-insulin dependent diabetes mellitus (NIDDM), a disease arising due to diet- and lifestyle-related factors. Over 90% of people affected by diabetes suffer from Type 2. Islam explained that a major problem for diabetic patients is constant high blood glucose, or hyperglycaemia. If untreated, it can lead to numerous complications. To maintain a physiologically safe level of blood glucose, diabetic patients are required to reduce the sugar-derived calories that they consume, using sugar-free sweeteners as an alternative. These synthetic alternatives without calories, such as aspartame, neotame, saccharin, sucralose and cyclamate, are widely available on the market. While chemically synthesised sugar substitutes are appealing because of their lack of calories, Islam is calling attention to their other side effects, some of which are potentially life-threatening. In addition to chemically-derived sugar substitutes, Islam is also conducting research on the side effects of widely-available natural sugar substitutes such as fructose, high-fructose corn syrup and maple syrup, since chronic consumption of these sweeteners can also cause obesity. Obesity can be a factor in the development of Type 2 diabetes, atherosclerosis, cerebral strokes, heart attacks and various other cardiovascular diseases. His research has led him to investigate sugar alcohols, a type of natural sugar substitute which are neither sugar nor alcohol, but are synthesised by the hydrogenation of different types of sugars or carbohydrates, particularly mono- and di-saccharides. Sugar alcohols also feature similar or slightly less sweetness when compared to sucrose, and some feature lower calorific content. Islam has focused on the particular sugar alcohol of erythritol. Islam’s recent study on erythritol found that while it does not reduce the absorption of glucose from the small intestine, it significantly increases glucose uptake for the production of energy, thereby reducing the blood glucose level in normal and diabetic conditions. ‘To understand the mechanisms behind the effects of erythritol on muscle glucose uptake, we investigated gene and protein expression which confirmed that erythritol induces muscular glucose uptake by enhancing the expression of some genes and proteins in the insulin signaling pathway,’ he said. Islam is working on this research in collaboration with medical doctors and collaborators from St Claraspital Hospital in Basel, Switzerland, where the team’s clinical trials with erythritol and xylitol (another sugar alcohol) are running. Islam spent a month in Basel in 2017 establishing this collaboration. The researchers have published a number of papers in international journals concerning various sugar alcohols, including the European Journal of Nutrition, Applied Physiology, Nutrition and Metabolism, the Journal of Physiology and Biochemistry, the International Journal of Food Science and Nutrition, the Journal of Food Science, Food and Function and the Journal of Medicinal Foods.